Every human culture has a fascination with superheroes. Sure, some culture’s superheroes may take on forms that are quite dissimilar to Superman, Batman, and Iron Man. Still, the idea of having someone to look up to for one reason or another is not unique to any group of people. Can you imagine life without Wi-Fi? I am pretty sure that for many of us, life was just fine without wireless connection as recent as five years ago. With the sudden deluge of Wi-Fi compatible devices, though, life without Wi-Fi (the Internet) could very well be unimaginable for a lot of people today. Think about it – when you go to a restaurant or a coffee shop, what is one of the first things you consider? When you book a hotel for a vacation, what is on the top of your list? I am willing to bet that Wi-Fi somewhere in there. So technology has given us so much convenience, but we could all use faster Wi-Fi, right? If the guys at Stanford are successful, we just might enjoy Wi-Fi at double the speed. They have developed a technology that will allow the use of a single Wi-Fi channel to receive and transmit signals simultaneously. The technology is called antenna cancellation, and basically, it deals with the self-interference that occurs when transmitting and receiving on a single channel. The result? Possibly full duplex communication. The implications of this technology are huge, especially for wireless providers. Even better, the technology is not limited to Wi-Fi – all radio communications can benefit from it. At the moment, the technology still needs some work, especially with regard to making it commercially viable. The researchers mention the need for antenna separation, but also say that there is no theoretical limit as to the applications of the technology. As for us consumers, we just need to wait till they get it out in the market, and we just might enjoy much faster wireless connections in the near future. Want to Rate Your Voice Impersonation Skills? Mobile phone subscribers call a number. They can listen to the particular sound/line they want to mimic, and they can record their own rendition. The users’ recordings are compared to the original sound bytes, and a score is given. Knowing just how good the Japanese are with technology, you can bet that these analyses are technologically sound! 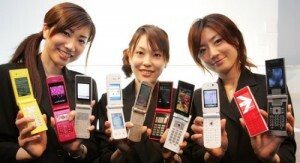 The service is compatible with most mobile phones available in Japan via the major phone companies: NTT DOCOMO, au, and SoftBank Mobile; and each call will cost a person about 10 to 20 yen. Oh, and to make things more interesting, users can invite friends to join a “competition” wherein the person who gets the highest score wins! NTT Communications is also known for its other services such as international data service centers, but this piece of news just goes to show that the telecommunications giant is not averse to offering fun and quirky services to their clients! It may not be for everyone, but hey, each to his own, right?